The College of Performing and Visual Arts promises a night of rich vocals and operatic scenes as they present a classical performance of Gian Carlo Menotti’s Old Maid and the Thief in It’s a Grand Night for Singing, November 8-11, 2017, at the Thorley Recital Hall. Tickets are $10.00 for adults and $5.00 for students and children. Southern Utah University faculty, staff, and students are free with a valid ID card. Faculty and staff IDs are allowed one guest. All are welcome and invited to attend. Professor Carol Ann Modesitt will be directing the production which centers on the paradox of the so called quiet life and the hidden agendas and power struggles in rural society. 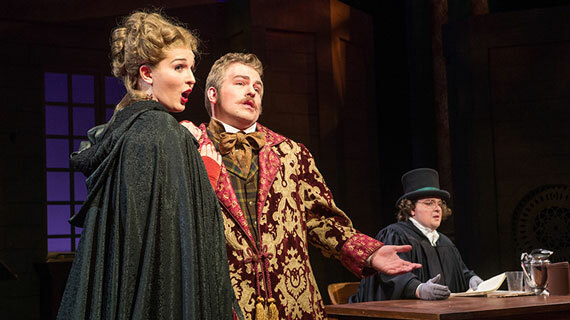 Miss Todd, the town busybody, her maid Laetitia, and a wandering man named Bob serve as the central characters to this delightful “who dun’ it” opera. The overlapping motives and relationships create a dynamic and lively tangled story of false accusations, unrequited love, and karma. Gian Carlo Menotti wrote over two dozen operas, several ballets, and numerous choral works. Menotti won the Pulitzer prize for The Consul and The Saint of Bleecker Street. He was born in Cadegliano-Viconago, Italy and held his Italian citizenship throughout his life but considered himself an American composer. His opera, Amahi and the Night Visitors was the first opera written for American television. We hope you will join us for a night of operatic music and enjoyment. For more information on SUU’s Music Department, please visit www.suu.edu/music.